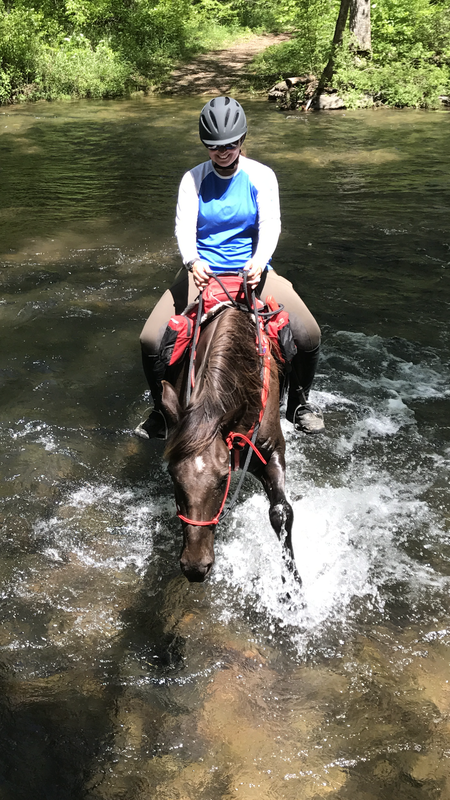 K and I met Amy Stone and Frills at a nearby trailhead Sunday to see how the mares get along and if they can pace together. For all the time we’ve spent together in camp, and K and I rode almost the entire Blackwater ride with Ricky (Amy’s husband) and Ziggy… and the talk of riding a slow OD100 together- we had never actually ridden together at all- and thought it would be smart to check that box the sooner the better. 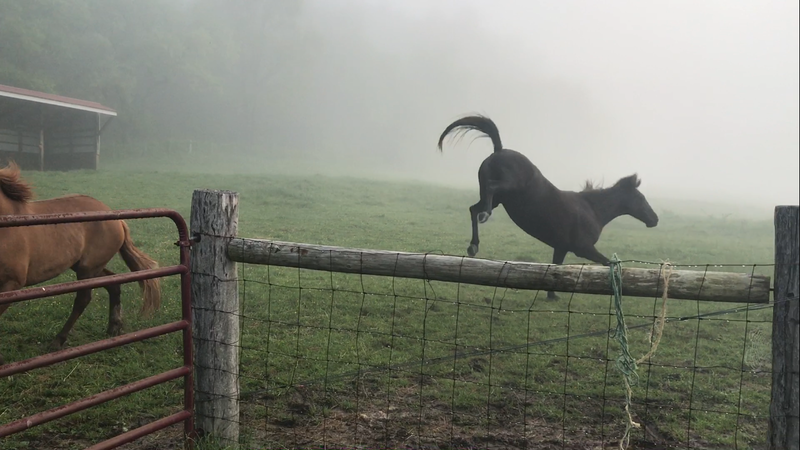 The misty morning… when I went to find Khaleesi this is what she was doing running the herd around in full Gallop with acrobatics. Always love that spirit. After the sun broke through the mist it was a gorgeous May day with sunshine and a light breeze. I was unfamiliar with the trails though I’d followed a group on them a couple months back. 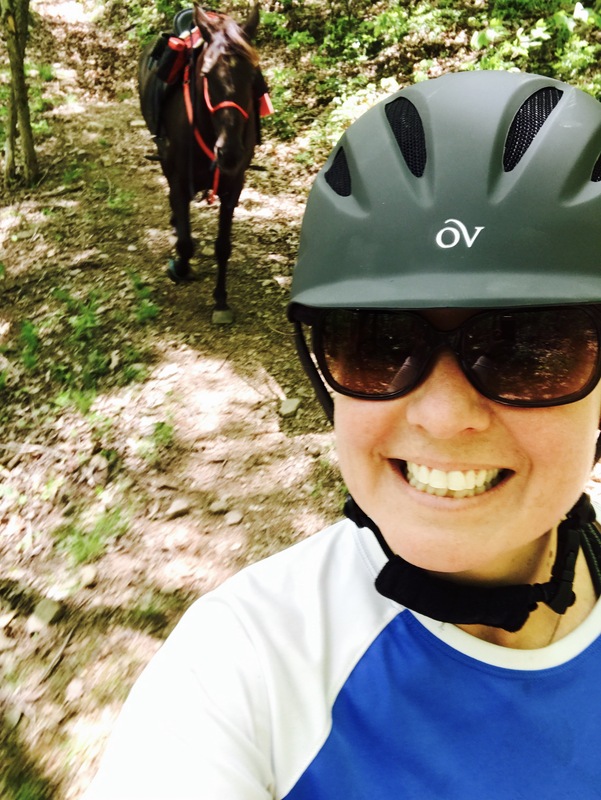 We were armed with some verbal options (there are many trail choices) and I had my GPS so no matter what we should be able to get back to the trailers! After a warm up walk/trot on the fire road we hit the mountain with a good climb. At the top we choose our own adventure by heading down into the campground and river valley. Me Out loud: How is Frills with river crossings? Amy: She’s fine… no trouble with river crossings. We could do as many miles as we wanted down in the valley depending on terrain and how bad the river crossings were (lots of recent rain has the rivers up and flowing fast), then we could return and head the other direction along the ridge as long as we needed to add miles. If it’s impassible we’ll just come back to the ridge sooner. Turns out the river was high but gave the girls no trouble, though the first one or two Amy watched us cross and had some doubts, but Frills followed like a champ. By about the third deep crossing with fast rapids flowing by she actually was able to smile! The trails down the valley were mostly soft grass-dirt which was perfect for my needs to save Ks feet. Especially considering we’re riding in a boot on the right front. 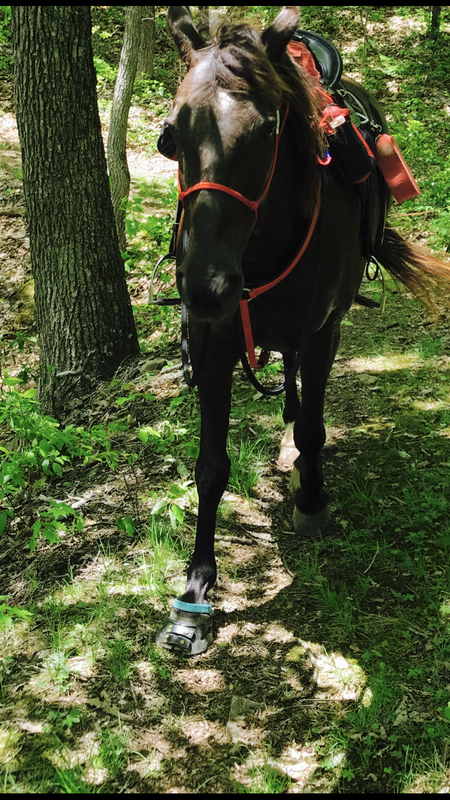 By the way we are still on 100% success on the Scoot boots… mud, massive river crossings, rocks at all gaits with lots of cantering and we’ve still never had to look for a Scoot Boot! 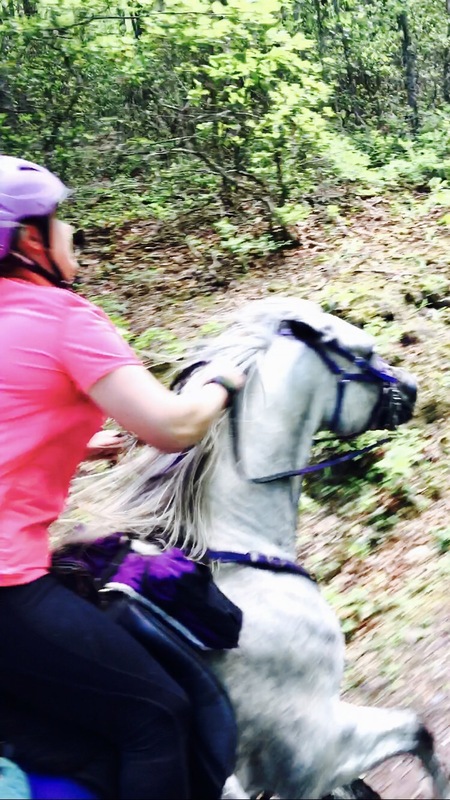 We enjoyed trotting and cantering along the river and it was beyond my expectations a gorgeous and fun ride! After we’d gotten enough miles and hit yet another crossing (I believe there were 5 or 6 each direction) we opted to turn back. 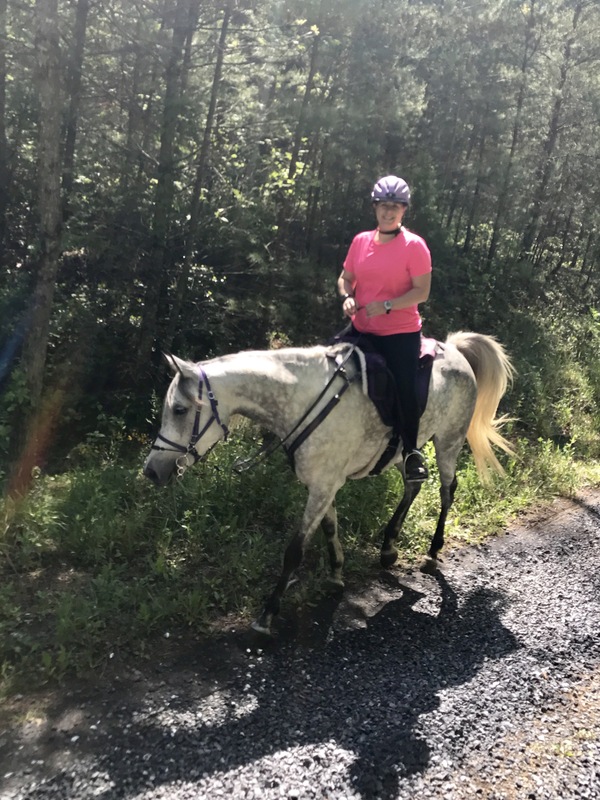 On the return was the famous 2 mile service road climb that is great for the Dr. Jeanne prescription of cantering uphill till our heart rate reaches 200bpm then trotting to recover to 150bpm then up again. As fatigue sets in they will reach 200 faster but it’s a way to build cardiac fitness. I use it once in a while though certainly not every ride. The last time I took it seriously might have been with Suz on this very stretch before the Blackwater Ride. That time we had to recover 3 times in the 2 mile run. Fast Frills led the way and this time I couldn’t get Khaleesi to 200bpm to save my life. 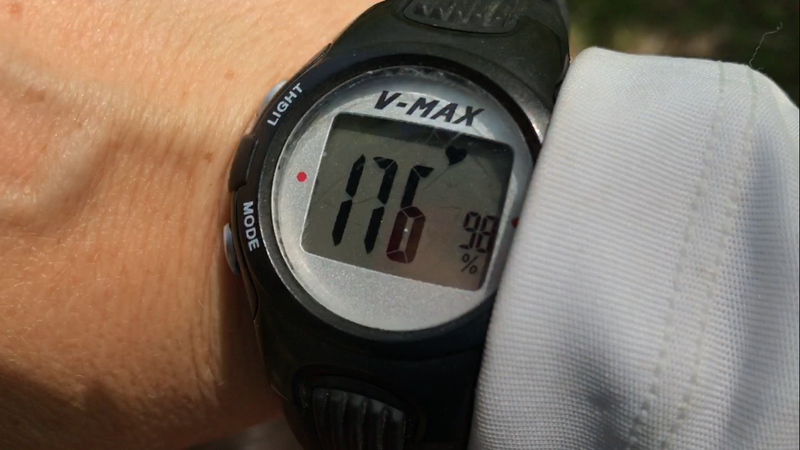 At one point she got to 194bpm and I was certain we’d pull back but as she continued to canter her rate went down into the 170 range… then down to 150 range. Roughly half way we came upon a nice clear puddle from the recent rain and both mares begged to stop for a drink. We obliged them (as we always do if they want water!) and after topping off they took off right into a canter again the rest of the hill still not reaching max before the top. Once at the top of the road we stopped momentarily in the shade and in about a minute K dropped down around 100bpm then we took a relaxed walk heading the final 2 miles back to the trailer. We may not be quite as naturally equipped or equal in beauty… but my little Apple Horse Farm Bred mutt is doing pretty well. Don’t try telling her she wasn’t as ‘highly bred’ because she doesn’t appear to have any self-esteem issues and gave a pretty good warning kick to Frills back at the trailers when Frills butted up to her most likely by accident. 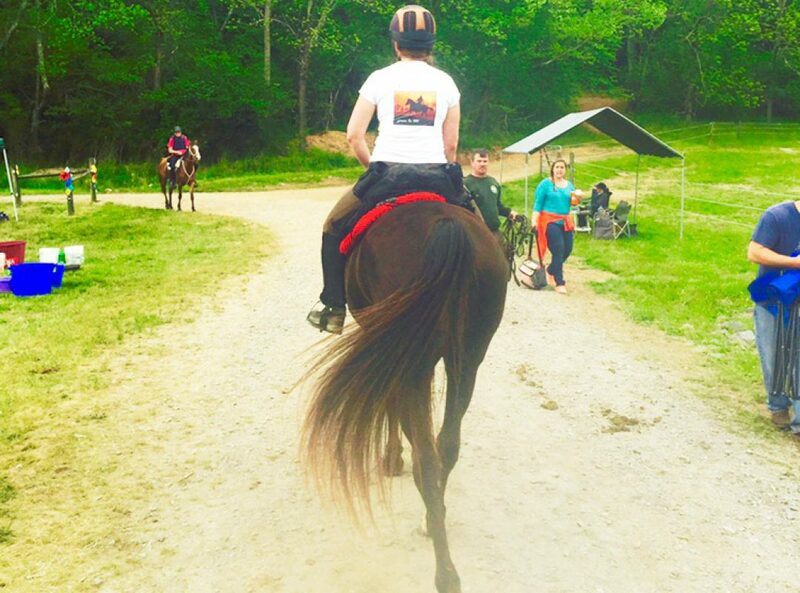 Seems K knew it was unintentional because it was truly a warning as I’ve seen her go after a horse that challenges her space and there is most certainly a difference! Oh right. Last 2 miles. 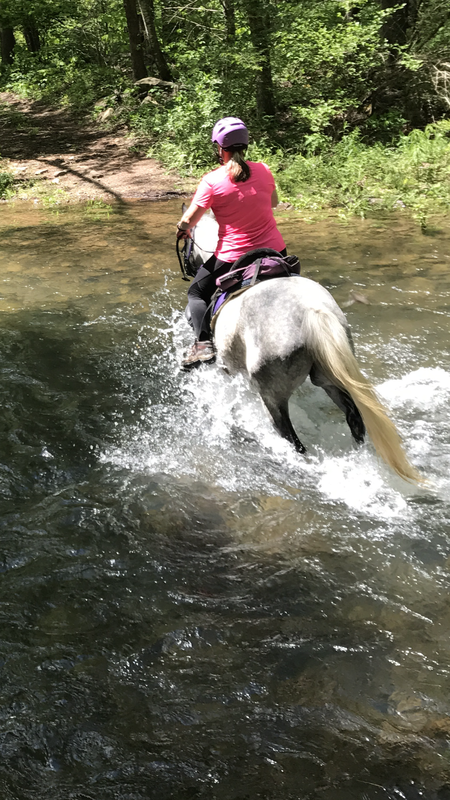 We took the steep climb down among the rocks as a cool-down walk after the canter work and Amy hopped off (her saddle began to slip forward). I took the cue and also dismounted. I realized how narrow the trail was- that we were headed straight back to the trailer and decided to leave my lead rope (aka. reins) clipped to my saddle and walked on to let K pick her own speed and munch some grass along the way. True to my assumption she never let us get out of sight around a curve without hurrying to keep up, and she never strayed from the path but kept a bit behind me. It was nice for a moment to trust her to come along as she would and not drag her by the head down the mountain. A lovely 15.5 miles in just over 3 hours. We allowed more dilly-dallying than we would during an event, more stopping to grab a bite, and a few moments of checking trails, GPS mileage, river crossing pictures and meandering. But I’ve grown to accept that on my training rides and trust that event day the girl knows the difference and gets to work. Every time. Truly… the horse is right. So will the mares work out together for 100? My guess is that Frills has a slightly faster working trot than K does. I am also super sensitive to not pushing K through rocks. And OD is full of rocks. I learned the hard way at Iron Mountain last August, and then saw the flip side at No Frills last month when she came through sound, happy and healthy on a tough ride- albeit almost last. I think it is possible that Frills may need to move along and we may get left to a slower pace and later finish. But if so- Amy is likely to fall in with a more moderately paced buddy and we can go it alone. It will entirely depend on how things go on the day of. K may pick up her trot to ‘race day’ speed and that may work for Frills – but one thing is sure, I know better than to push her faster through the rocks than she can manage without hurting herself and I am well aware that could just be slower than others with more adept footed horses without hoof rebuilding, concussion damage and past lameness issues are willing to move. The OD is no joke and the only way through that course is to focus on riding your strengths the do the best you can to accommodate the weaknesses. And the horses with fewest weaknesses end up top 10! All joking of breeding and royalty aside, Frills is a horse engineered to do well at the sport and with a good base of fitness behind her and a smart rider to navigate her through. Khaleesi is slightly younger (still developing into her movements) and carries the thicker skin and muscling of a more substantial breed crossing plus some hoof/foot issues I believe are now sorted out though I hope to see more long term changes in years to come that will make her a stronger competitor as she builds over seasons. 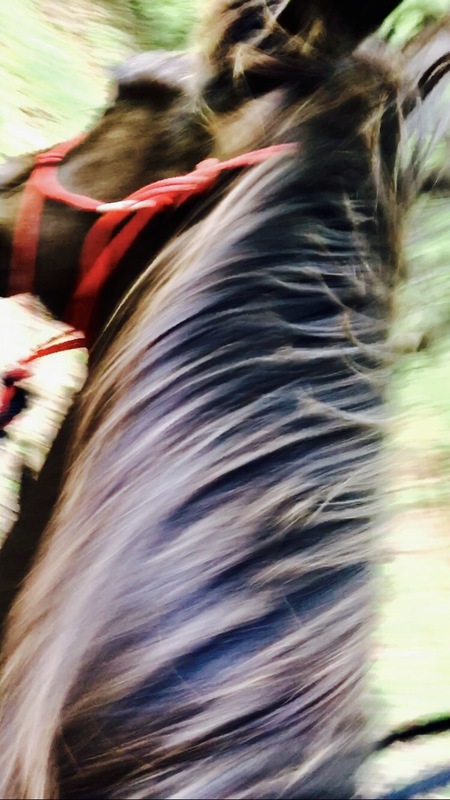 So Amy & plan to try to ride together and pace the mares as we are able… however I never begrudge a horse needing to move on and let us keep a pace that works for us. We will have to see how it goes and I won’t hold Amy to sticking with us if it’s not working for them. And K is not one to hurt herself to keep up with any pack. She is her own boss and we make up a herd of 2 with me (most generally) the mutually agreed upon leader. Ride your own ride is the only advice second to never hurry never tarry. And they all lead to the greatest hope…. To finish is to win. Previous: Previous post: Dragonfly in the sun… you know what I mean..
I’m impressed.If I left Nilla to follow me without holding the reins, she’d just stop and eat. She wouldn’t even care if we abandoned her.